Is there really any room for billboards in a modern-day marketing mix? Take a drive down any road and you’ll find that yes, indeed, the traditional billboard is alive and well. And not only billboards, but a whole range of outdoor advertising in all sorts of sizes on everything from bus stops to rubbish bins to skyscrapers; both digital and static. So what should you consider when putting together your billboard? 1. Location, location, location – This may be dictated somewhat by your budget. High-traffic areas obviously attract a higher cost. If your business is geo-location dependent (i.e. you have a physical store or service a certain geographical area) then your billboard needs to be in or near that area. Also consider how cluttered the location is in terms of other “outdoor furniture” and buildings, and which direction it is facing (towards or away from your business for example). 2. Can it be read? – Less is more when it comes to billboards. If the font is too small, you won’t be able to read it, if there are too many words, you won’t have time to read it. The vital information needs to be taken in within seconds, so if the info doesn’t need to be on there, take it off. Take note of the speed limit at the location – more can be read when sitting in traffic as compared to travelling at 100km/hr. 3. Does it stand out? – Look at the environment within which the billboard will sit. If it is out in a field a green background won’t stand out. If it is in an urban environment you’ll need to consider the colours around it that are trying to compete for attention. 4. Is it “dangerous”? – Some might argue that this isn’t their problem, but to protect your brand from potential negative fallout, consider whether any images on your billboard might be distracting to drivers, offensive, or inappropriate for children. 6. Digital or Static? 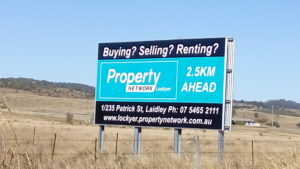 – Clearly there are far more location options with static billboards, however if you are looking for high-traffic areas there is a good chance a digital billboard option may be available. Benefits of digital include no printing costs, being able to change your message quickly and easily and options for using video or animation.